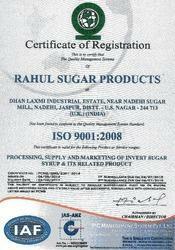 Incorporated in the year 2007, Rahul Sugar Products, is an ISO 9001:2008 and ISO 22000:2005 certified manufacturer and exporter of a broad range of Invert Sugar Syrup, Golden Syrup Invert Sugar, Bakery Grade Invert Sugar Syrup, Juice Grade Invert Sugar Syrup and many more. In this range, we offer clients Diamond Gel Invert Sugar, Golden Syrup Invert Sugar and Honey Grade Invert Sugar. Our professionals process these sweeteners using best quality ingredients that are obtained from the certified vendors of the market. We stringently follow industry laid standards to process these. Offered products are known for their remarkable features such as low ash content, constant color and aroma, non carcinogenic and high solubility than sugar. We believe in serving our large clientele the quality of products and to carry out all the business operations in a swift and smooth manner, we have constructed a sophisticated infrastructure facility with the latest technology. Our infra is segregated into several units that help us in performing all tasks in a streamlined or free flow manner. We have divided our infrastructure into processing, quality controlling, warehousing, and various other sections. To handle the responsibilities of these units, we have hired a team of experienced professionals. These professionals are well-versed and highly experienced in this domain and aid us in acquiring maximum level of clients’ satisfaction. Owing to the sincere efforts of our professionals, we have been able to garner a vast clients around the world. The invert sugar capacity of the unit is quite large , which is supplied throughout the country as well as it is also being exported. 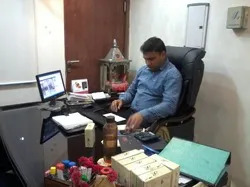 Owing to the notable guidance, mentorship and constant motivation of our directors, Mr. Rahul Gupta, we have been able to care and create a unique niche in this domain. His immense experience and support have helped is in gaining a reputed position in the market. His vast experience into the industry led us a smooth and easy path to the success. We have gained a huge recommendation from our clients and have clientele around the world. We export our products to Australia, Philippines and UAE. Being into the manufacturing of products in a broad range we have a well experienced team of professionals. They are well trained under the customized infra so that they can liable to produce the high quality products. The team is build up of quality workers and goes under full training before being put them on to the work. Our team is well co-ordinated with each other to produce the productivity in a given deadline or to meet the clients requirement. We have developed a sophisticated manufacturing infrastructure facility, which enable us to execute all operations swiftly. 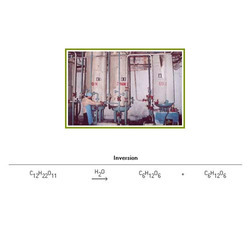 Our infra is well equipped with the advanced tools and other equipment for the processing of offered Gel Invert Sugar. 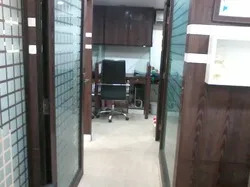 Further, to carry out all business processes in a systematic manner, we have segregated our premises into numerous sections. Production capacity of our modernized processing plant is 3600 mt per annum. 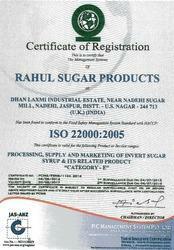 We have large-scale production capacities, huge production capability ensure that product availability at short notice and at competitive prices, enabling Rahul Sugar to cater to major domestic and export requirements. We have a qualified able and experienced managers lead well qualified personnel and trained workers. Our organization puts it sincere efforts to acquire higher level of clients’ satisfaction. For the same reason, we are offering premium quality Gel Invert Sugar. Our professionals work in close contact with the clients, to understand their every minute requirement and meet them accordingly. Further, with the help of our logistic personnel, we assure the timely delivery of all the products, at customers’ end. 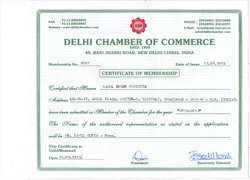 We are a certified member of Delhi Chambers of Commerce.